Wind Mitigation Inspection: The Wind Mitigation Form is an insurance inspection that documents the wind mitigation attributes of a home. These attributes help qualify your home for premium discounts on your homeowner’s insurance policy. 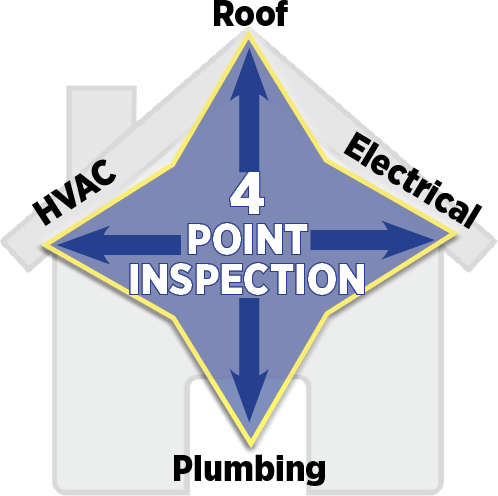 4 Point Inspection: A Four Point Inspection focuses only on four main areas of interest in a home: HVAC (Heating, Ventilation and Air Conditioning), electrical wiring and panels, plumbing connections and fixtures and the roof. This report is required by insurance companies on properties over 30 years of age (in some cases over 20 years).